Mandatory gear for sectional boaters. 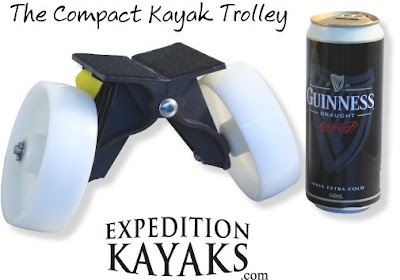 Oh, and you could say the kayak trolley is mandatory, too, I suppose. This is one slick trolley. 10 inches wide when opened and only 5 inches high - sweet. I assume that this would strap near the end of the 'yak and you would be at the other end. Although you would be carrying more weight than if the fulcrum were nearer the cockpit, the compact nature of this ingenious little trolley is really exceptional. I'm going to put my engineering mind to work on creating one of these for myself. There must be a way to accomplish this using readily available materials. Might have to make some concessions to accomplish this though. Any ideas on what one of these doobies costs? Hate to spend 80% of the cost of the "official" model and end up with an inferior item. This was 185 dollars Australian. Don't know how much that is USA. Maybe 120 bucks? Guessing. Yes. Pls make and tell me how u do it.